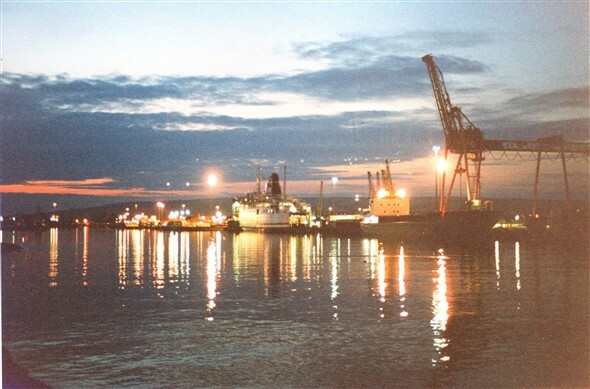 A picture of the harbour taken on the spur of moment when retuning from the west beach one summers evening in the late 1980's / early 1990's at 10 o'clock at night in the month of July. This page was added by John Hills on 08/03/2008. Chartres, John! Senlac left for the final time in 1987. Chartres was running alongside Versailles by this time. That's one of my favourite spots for taking a photo. The angle's just right; looking upriver. Night and a high tide only make it better. Great shot John. love the reflection of the lights on the water mate. Thank you for the correction Andy, just testing to see you are paying attention !.. the ships all look the same to me at night ! I think the picture was more likely to have been taken in the late 1980's ..I remember holding the camera on the top of a concrete fence post to keep it steady for the 2 second exposure..
Do you know when the " Tango " crane arrive on the East Quay ?